A team of scientists and engineers at the U.S. Department of Energy's (DOE) Brookhaven National Laboratory have developed a new scientific instrument that enables ultra-precise and high-speed characterization of protein crystals at the National Synchrotron Light Source II (NSLS-II)—a DOE Office of Science User Facility at Brookhaven, which generates high energy x-rays that can be harnessed to probe the protein crystals. Called the FastForward MX goniometer, this advanced instrument will significantly increase the efficiency of protein crystallography by reducing the run time of experiments from hours to minutes. Protein crystallography is an essential research technique that uses X-ray diffraction for uncovering the 3-D structures of proteins and other complex biological molecules, and understanding their function within our cells. Using this knowledge about the basic structure of life, scientists can advance drug design, improve medical treatments, and unravel other environmental and biochemical processes governing our everyday lives. For this technique to work, proteins must be crystallized—and the most challenging proteins often only grow into tiny microcrystals. To reconstruct these complex protein structures, scientists need to measure X-ray diffraction data from thousands of microcrystals and merge the collected data, a technique called serial crystallography. These measurements currently take hours at highly specialized and advanced research instruments at synchrotron macromolecular crystallography beamlines to complete. Macromolecular crystallography beamlines can be found at nearly every synchrotron radiation facility in the world and use the light sources' intense x-rays to characterize the proteins' atomic structure. "Using our new ultra-high speed and high-precision FastForward MX goniometer, we are able to collect serial crystallography data so fast that complete datasets can now be acquired in just a few minutes," said Martin Fuchs, the lead scientist at the Frontier Microfocusing Macromolecular Crystallography (FMX) beamline at NSLS-II. "Our new goniometer takes full advantage of the exceptional beam properties of NSLS-II, and therefore of the world-leading bright x-rays available at our beamline." The team developed the new goniometer specifically for the FMX beamline's one micrometer sized, intense X-ray beam. FMX now gives researchers a unique capability to measure X-ray diffraction data from incredibly tiny crystals at much higher rates than at any other synchrotron light source. "The small beam size together with our new fast scanning technique gives us the ability to determine the structure of biological molecules from tiny protein crystals that previously would not have been large enough to collect data from," said Fuchs. The goniometer can position protein crystals with a precision of 25 nanometers (4,000 times smaller than the width of a human hair) and ensures that the tiny X-ray beam can precisely illuminate microcrystals for diffraction measurements. "To achieve this precision and speed we needed to overcome many technological challenges. For example, we needed to develop a way to move the crystal in these extremely small steps and, at the same time, measure these small movements," said Evgeny Nazaretski, a physicist and X-ray microscopy instrumentation specialist at NSLS-II. "We had to combine expertise from different fields such as X-ray microscopy and structural biology to enable this kind of development." 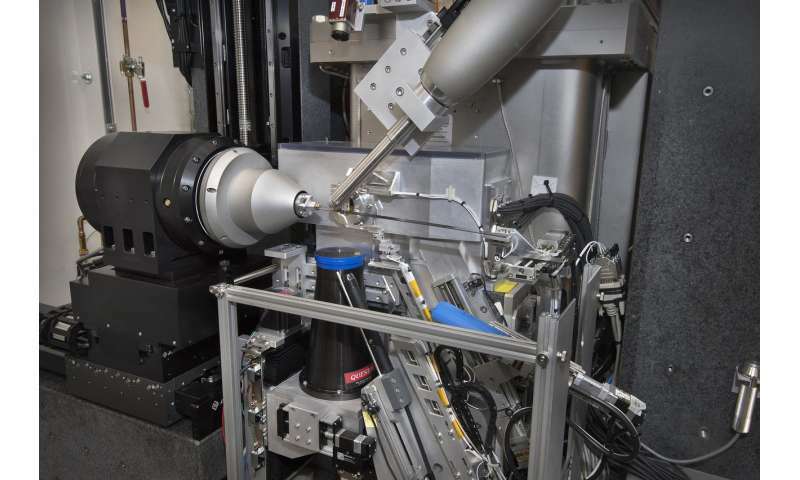 Brookhaven's Laboratory Directed Research and Development program funded the two-year long design and construction process, including all steps from conceptual design and laboratory characterization to integrating the system into the experimental environment at the FMX beamline. Yuan Gao, a research associate in this project, tested the goniometer thoroughly over the course of the development for its stability and optimal performance and demonstrated scanning speeds of up to 100 Hertz and data acquisition rates of 750 frames/second. A single serial crystallography experiment can require hundreds thousands of frames of date. 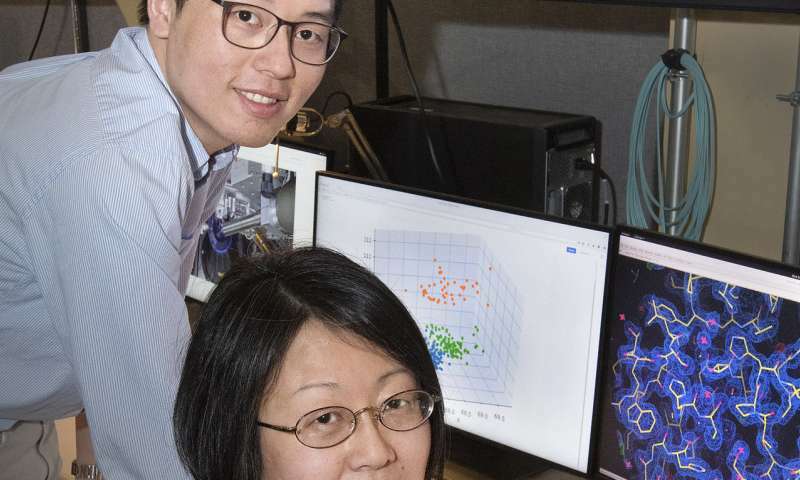 To demonstrate the performance of the newly developed goniometer, the team used it to characterize two well-known proteins' structures, bovine trypsin and proteinase K, and compared their new reconstructions to the existing knowledge about these two protein structures. "We measured these two known proteins using the FastForward goniometer at FMX and developed a data processing workflow that automatically analyzed the data as we collected it," said Wuxian Shi, a scientist at the FMX beamline. "With this, we were able to solve the structures and show that the data gave high-resolution and high-quality structures, even at the fastest collection speeds." As a next step, the team is working to enable robotic sample exchange during the experiments to increase the throughput of the FMX beamline even further. This system will then be made available to the beamline's general user groups, and open a pathway to structure determination from crystals smaller than ever before.